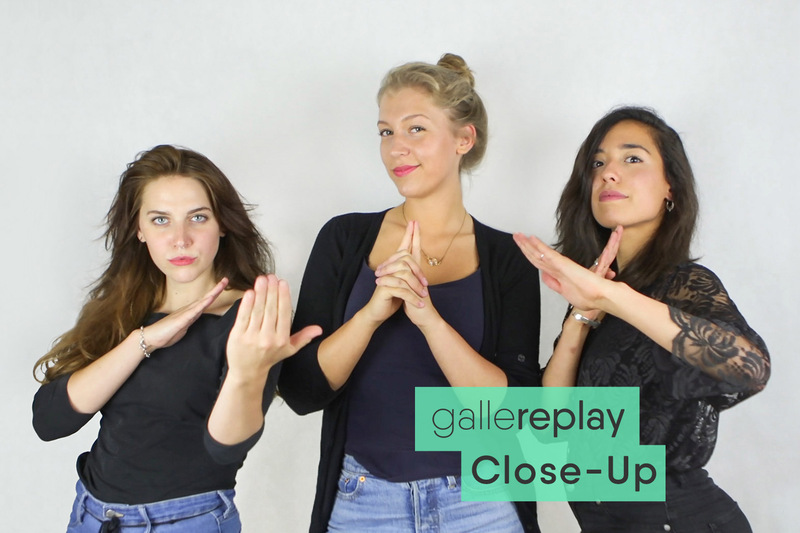 Meet gallereplay’s angels, the power trio in charge of marketing, community management and graphic design! Read about their most extraordinary moments working for gallereplay, and find out how teleportation and time control could change their lives! Fabienne: During our move to the new gallereplay office we were carrying furniture. During this procedure, I stumbled and fell through an open door, in front of our colleague Sophie! She didn’t look surprised…Soumia on the other hand, was very amused! Soumia: Karaoke night was definitely hilarious! However, I will never forget the moment when Marco almost burned down our previous working place by “cremating” his stroopwafel (a Dutch syrup waffle) in the microwave! Fabienne: This medium is quite new and therefore really interesting. It can be challenging to promote a medium that people barely know. As Marketing & PR Associate it’s particular challenging for me! This is one of the reasons why I love working with cinemagraphs. Jette: Cinemagraphs are a unique way for brands to stand out from the crowd. This can lead to many great possibilities. In my opinion they combine the best of photo and video. And the most important thing, they make me SMILE! Soumia: Cinemagraphs are exciting, extraordinary and the future of storytelling! It’s quite challenging to keep your eyes off them without being caught under their “looping” spell! Fabienne: My dream project would be working on a big campaign for a well known brand. The perfect goal for this marketing project would include cinemagraphs on outdoor screens! Just imagine them on a display in Leicester Square! Jette: I am a huge fan of Scandinavia. It’s on my bucket list to go on a road trip and explore the beauty of the Norwegian fjords. I would love to capture lots of cinemagraphs there or to create some paintings! Soumia: I would like to work on a project where I can highlight the beauty of diversity by bringing art, technology and music together! Not sure what the project will involve, but perhaps you will find out more in a future blogpost! Fabienne: The power to control time! On private dates I am always running late, so it would be great to stop time in order to be punctual (for once)! Jette: I would definitely say teleportation. I would first teleport myself to New Zealand to get blown away by the sunrises there! After that, I would flash myself to Italy to explore some idyllic Mediterranean towns! Soumia: The ability to turn traffic noise into nice music while freezing the surroundings, so I can showcase my groovy dance moves to my frozen audience! Fabienne: Seeing them on public transport would make me happy. I could stare at them for quite a while and discover every little detail.Time would fly by. Jette: The medium is becoming more popular. I think it would be very interesting to see how other graphic styles could be translated into cinemagraphs. A nice example of that is artist Sammy Slabbinck, who combines photography in surreal collages and prints. Soumia: Personally, I would like to see cinemagraphs on packaging! Just imagine dripping chocolate or crunched cacao beans portrayed on your favourite chocolate bar! Probably bad for my endless cravings, but ideal for marketers and brands! Read more about the gallereplay team on our blog, or follow us on Facebook, Instagram and Twitter for our latest updates!